AKG, a Harman company, is a consumer as well as a pro audio brand, specializing in both headphones and microphones. 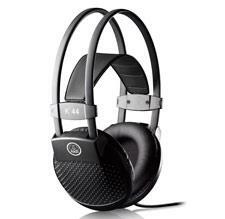 The K44 reviewed here is part of AKG's professional headphone line. It is more than entry-level for the company, but far from being what AKG would label flagship. Retailing for $79.99 (though street prices are far lower) and available virtually everywhere AKG is sold, both online and retail, the K44 is a solid entry point to the AKG brand and one heck of performer, as I would find out. The K44 is a closed-back, circumaural design featuring two well-padded ear cups, held together with a large self-adjusting head strap. The ear pads are a combination leatherette and velvet, which surround AKG's patented Varimotion speakers. The K44 only comes in black, which has a matte sheen, thanks to its all-plastic construction. Also, there is an almost ostrich-skin texture to the ear cups' plastic that appears to be entirely decorative. Efficiency for the K44 is rated at 115dB SPL/V, with a reported frequency response of 18 to 20,000Hz. Impedance is listed at 32 ohms, with total harmonic distortion coming in at less than one percent. Max input power is said to be 200 mW. You have a choice of connection options, including a standard stereo mini-jack and a convertible jack plug adapter that comes standard with the headphones. 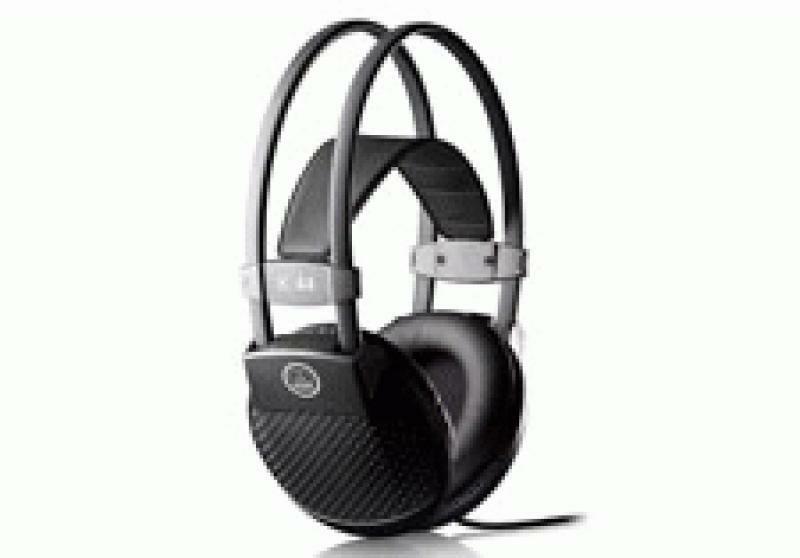 The total weight of the K44 is 190 grams or 6.7 ounces, making it surprisingly lightweight for headphones so large. I listened to the K44 exclusively for a month while doing a freelance stint at a local entertainment design firm, where they were plugged directly into either my smart phone's headphone jack or the front-mounted headphone input on the office's Mac Pro tower computer. The music varied, as did its quality, for I listened to everything from low-res streaming to self-ripped (lossless) discs. Despite not possessing any sort of active noise cancellation, the K44 does an admirable job of keeping outside distractions at bay; enough so that you can enjoy your music but not so much as to completely block out the rest of the world, which may or may not be a good thing. For me, it's always nice to still be able to hear my name being called over an intercom system, but not hear the person next to you carry on an inane conversation about a cat named Peaches. I was able to wear the K44 for prolonged periods without fatigue, physically or sonically. The head band possesses enough elasticity to allow it to conform to any head shape, while still imparting a snug and secure fit, although it is wide enough to ruin hairstyles after prolonged periods. Still, I prefer its lightweight and less-is-more approach to the often overly-padded and heavy bands of many of today's popular consumer or pro studio headphones. In terms of sound quality, the K44 was surprising, possessing an open and airy high-frequency performance coupled with a lithe but still natural midrange. I've heard headphones with a bit more weight in the midrange than the K44, but sometimes that weight comes at the expense of sounding too rich or even thick, which the K44 does not. I would say the K44's midrange was ever so slightly lean of neutral (my subjective opinion), but not so much as to make it cold or analytical. Bass was good, possessing solid extension and impact, though the K44 fails to play as deep as, say, Monster's Beats by Dre. The trade-off here is that, while the K44's bass sounds more natural than what the Beats dish out, it just doesn't seem to plunge as low. For my personal taste, I prefer the sound of the K44's bass. As with its high-frequency performance, it possesses air, whereas with other more bass-savvy cans, the feeling is far more "dead," hitting with a thud instead of a thwack. Read about the High Points and Low Points, Competition and Comparison, and the Conclusion on page 2 . . .